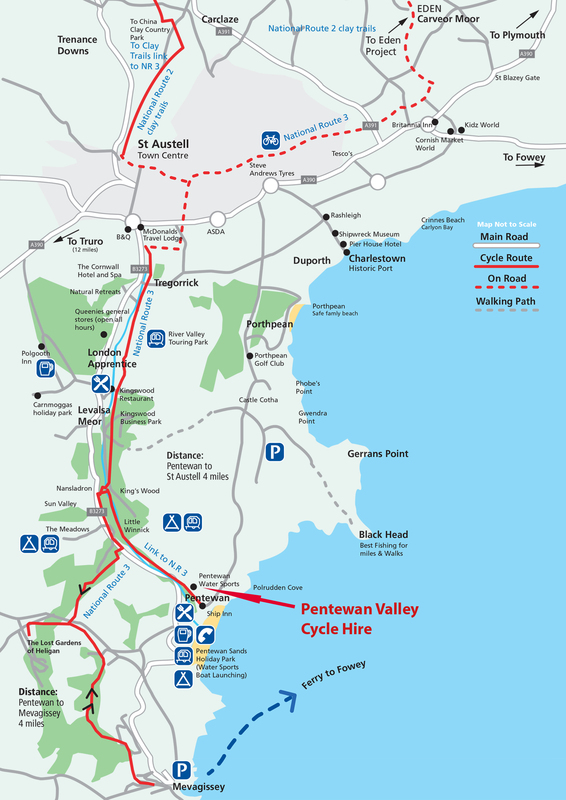 Pentewan Valley Cycle Hire has quality bikes for hire for adults and children. These are also available with trailers for smaller members of the family. Even a trailer for your dog! Follow the trail from Pentewan Valley Cycle Hire, through the beautiful woodland and by the river of the Pentewan Valley Trail, the Cycle Network Route 3. This joins up with the Clay Trails Route and the Cycle Network Route 3, which are mostly off road cycling. The Clay Trails were established in 2005, and are based around the St Austell clay mining industry that dates back over 250 years. The Clay Trail goes around the ancient town of St Austell offering fantastic views of Cornwall and great cycling through the beautiful Cornish countryside. There is an off road trail running from St Austell to the Wheal Martyn Clay Museum. This trail runs for 1.9 miles. From the Clay Museum you can follow the trail for another 5 miles until you reach the Eden Project. You can also follow the Clay Trails from St Austell to the Eden Project running in an anti clockwise direction. This trail does take you through St Austell using the Cycle Network Route 3. So please note this is not an “all off road” route and it does take you through parts of St Austell. If you are planning to cycle this route I would advise you to allow one whole days’ bike hire, or more if you want to explore more of Cornwall’s stunning scenery.